Purple Caper Seeds are available Here! Get yours now for a bumper crop! are meticulously bred to be among the best cannabis genetics on the market. While most focus solely on the mothers, we pay close attention to the fathers because they carry and pass on crucial genetic traits which have strong influence on the offspring of a strain. Our Fathers are typically F4 BX, and our DNA analysis can be found in the Phylos Galaxy. - Most Purple Caper Rx seeds are capable of yielding a pound of medicine each, if grown outdoors correctly. – Seeds make the best mother plants. – Clones are stronger from Seed Mothers. – Seed plants are usually much bigger than clones when grown in the same garden. The Purple Caper has been growing in California for over 25 years indoors and outdoors. We are known for the best fathers in the Bay Area and Central Valley. There is an abundance of Landrace, Heirloom, and Designer Strains here in California. We collect these from the most prestigious clubs and growers in the area. We then pollinate the best of the best with our best of 50 or better pedigree fathers for world class results. We specialize in designer strains with the biggest yields and highest quality. Chocolate Kush is next. This is a cross of the famous Chocolope Cheese male crossed with a pure Moroccan Hash Plant. Then backcrossed for purity. This supersedes the Chocolope Cheese male . Amazing Sweet Kush! CottonCandy BubbleGum, A cross of two classics bred in an outdoor project for maximum results outdoors. This male throws truly amazing offspring. Girl Scout Cookie, Fire Lady, and River are new strains available here in California released in 2012. Still very rare only available at the best clubs. 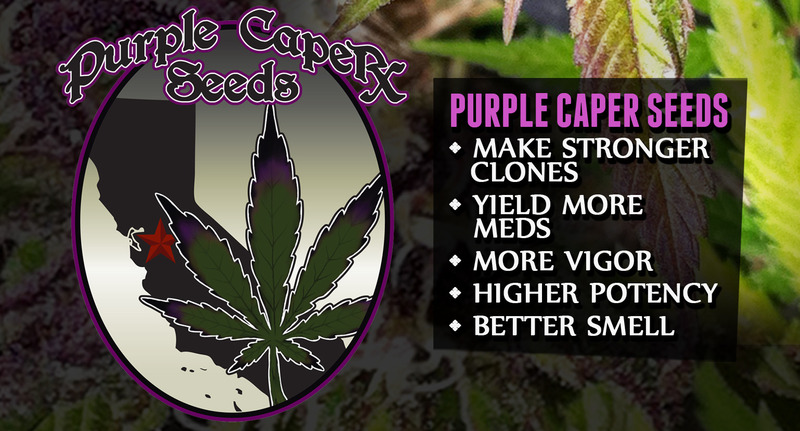 Purple Caper Seeds RX are Micro Bred indoor and outdoors in small batches to ensure quality. Batches may be as low as 50-200 seeds per run. Currently there are 60 working mothers and 6 working fathers, with over 300 total strains possible. We currently reproduce around 20 different ones which we tested as best of the best. There are several small batches and one of a kind limited edition specialty runs done for customer appreciation. Many times a local grower or Collective will ask us to cross his or her favorite strain with one of our pedigree Fathers to improve genetics for them. We give them most of the seeds and release only 5-10 packs. These may not be produced again and may be the only release. Each dispensary will have a unique selection. If you see a pack for donation that is not in the catalog it may be a limited edition small batch run and may not be available again. Because of the small batch procedure, we can only provide the most popular varieties year round. Outdoor Fathers are bred outdoors, and indoor fathers are bred indoors. All are grown organically. 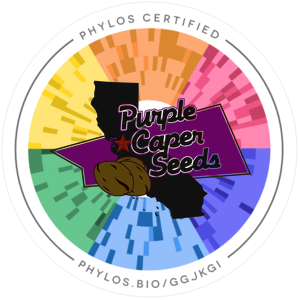 Purple Caper Seeds are all bred organically, and recommends that all medicine be grown organically. We breed indoors and outdoors organically. You can run any system organically, and be green and eco-friendly. Cannabis should be grown like vegetables, as with anything that is ingested into the body. Chemical Fertilizers and Nutrients can be dangerous to the environment and people’s health. There is organic alternatives any chemical product . Organic fertilizers and nutrients work very well indoor and out. Organic medicine has a superior flavor, smell, and cleanliness not available chemically. Growing organic is good for you, and good for the earth.